East Hanover MP Dave Brown (3rd from left) and CEO of Island Grill, Thalia Lyn (centre), take time out for a photo op with the Board of Directors of Hanover Charities who awarded over 146 students, organizations and entities with scholarships and grants spanning US$600,000. From Hanover Charities are (from left) Secretary/Treasurer Roy Ten Fah, Board Member Shadai Miller, Director Pernel Crossman, Chairman Katrin Casserly and Director, Custos Dr. David Stair. Following an extremely successful year of fundraising, Hanover Charities hosted its annual grant ceremony on Thursday, June 21, 2018, at the Round Hill Hotel and Villas. The charity awarded over 146 students with the Morris/Watkins Memorial Scholarship as well as provided grants to a number of organizations and groups dedicated to serving Hanoverians. Raised primarily from the Sugar Cane Ball, the proceeds to fund the awards amounted to a record-breaking US$600,000. “They trust us at Hanover Charities to execute this vision for the common good, to pass the baton of help to each and everyone here today. ‘No man is an island’ and ‘Rain nuh fall on one-man house top’,” she continued. Last year, one of the many visits of Hanover Charities was to the Logwood Basic School where over 120 children shared a small building with no office accommodations for the hard-working teachers and dedicated principal. Hanover Charities mobilized action by investing over $3 million in a joint project with Western Hanover Member of Parliament Ian Hayles. The basic school now boasts three (3) new classrooms and a brand new building. “It fills our heart to be able to contribute in such a meaningful way to our parish development, especially education. This is what we call the relay of life: we present help, you help one and that one helps another,” said Casserly. “We at Hanover Charities believe that the partnerships between government, private sector and NGOs are essential for our nation’s growth to build a better Jamaica for us all. With these generous donations which have been entrusted to us at Hanover charities, we are able to slowly make the gap smaller between the haves and the haves not through education,” said Casserly. Present at the awards ceremony was Member of Parliament for Eastern Hanover, Dave Brown, who congratulated Hanover Charities for raising the bar where commitment to service is concerned. He charged the recipients to use the awards for learning and discovery and a launching path for their future careers. “I urge all recipients of grants today to go forward and do well in your studies and later endeavours, however, when your long term goals and studies would have been completed, I beg of you to return to Hanover and give back and build the parish,” said MP Brown. 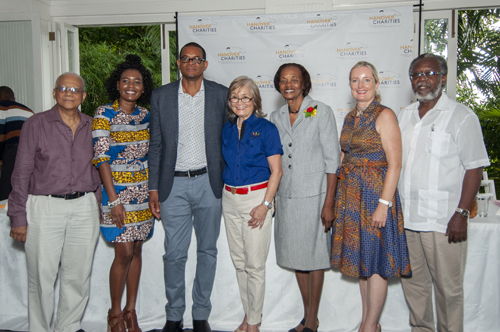 Casserly acknowledged the hard work of the board members, fundraising committee members and volunteers, some of whom are not based in Jamaica who, together, have amassed a combined $81 million. Amongst contributors are the Round Hill and Tryall owners and management, the guests at the Sugar Cane Ball and the contributing community in Western Jamaica for the remarkable generosity in trying and difficult times. She also gave a nod to Ralph Lauren for being among one of the single largest donors of Hanover Charities.